We offer excellent cleaning of rented flats that need to be prepared for the next tenants. Our team of qualified cleaners can do the cleaning work which is required by the landlord in order for the lodgers to receive their full deposits. Our professional end of tenancy cleaning is suitable to be used by landlords, estate agents and tenants. Call us and order it any time when you need thorough cleaning of the flat or house which you plan to leave or offer for renting out. 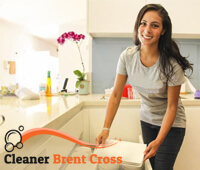 Our company is located in Brent Cross where we provide our end of tenancy cleaning services. The end of tenancy cleaning which we offer is affordable and done by qualified cleaners. They will inspect the rooms and estimate the time which will be necessary to do the work as well as inform the customer about the price of the service. Our cleaning staff will dust and wipe the wooden pieces of furniture, audio, video and other appliances in the living areas and bedrooms. They will remove the grease and stains from the oven, dishwasher, microwave and the rest of the kitchen devices. Our cleaning staff will mop and wipe the floors, vacuum clean the carpeted areas, under all beds, sofas and armchairs. They will provide comprehensive cleaning of all the rooms in the property. You can be sure that your landlord will be pleased with the cleaning which we provide. Our end of tenancy cleaning is at your disposal in Brent Cross every day in the week including at bank holidays and weekends. You can rest assured that your rented property and the flat or house which you offer for rent will be in a flawless condition after we clean it. The end of tenancy cleaning which we provide is low-cost and reliable, available seven days in the week in Brent Cross.